Today's review is of a product that I bought solely on the recommendation of one of my favourite You Tubers, Juicy Tuesday. 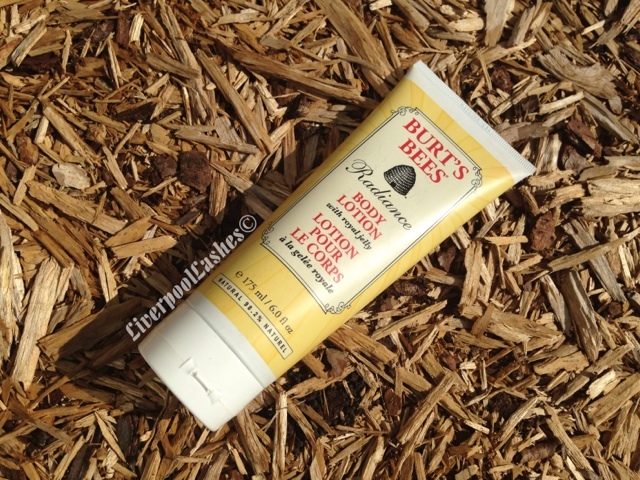 Teresa spoke so highly of the Burt's Bees Radiance Body Lotion that I simply had to purchase it. The formula is a medium consistancy with a slight hint of a shimmer in it. I'm trying to describe the scent and I'm not sure that I can. It's pleasant and some might possibly say it's a Royal Jelly scent which is what it's formulated with. I do find that I had to be careful not to apply too much lotion to my skin or it could make it feel sticky but providing that you use it more sparing it gives a beautiful healthy sheen. I'm not entirely sure that I would buy it again as I really don't like the stickiness it sometimes gave me but applying a little to my chest and shoulders in the summertime with a little bit of a tan is really nice.